Youngsters learning to play instruments with Alford Silver Band are to benefit from a donation by two residents. 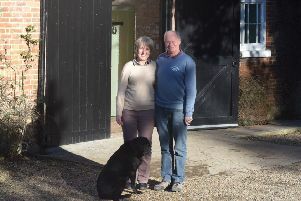 Manfred and Shirley James have donated funds to purchase two training trombones specifically for two younger players, Maisie Allen and Sean Briggs, who have recently taken up music. Band chairman Martin Briggs said: “The band has a thriving training section and we have recently had an influx of youngsters anxious to learn to play a brass instrument. Some of the traditional brass instruments are just too heavy or too cumbersome for them to manage comfortably, so we wanted to get special instruments to help them to learn until they are able to graduate to brass instruments. “As well as being lighter to handle, the trombones are configured differently so that they don’t have to be extended so far. This is a great help to a youngster whose arms just aren’t long enough. Manfred’s father, Albert, was a founder member of the band when it re-formed in the 1960s, which is why his son has a bit of a soft spot for it. For details, visit, www.alfordsilverband.co.uk, or call Jane Taylor, on 01507 466330.